Humans is the second book of the Neanderthal Parallax, a series about the interactions of homo sapiens and homo neanderthalensis after the latter accidentally opens a portal into our reality during a quantum computing experiment mishap. 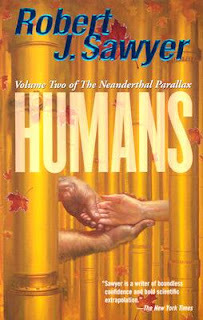 The first book, Hominids, was the 2003 Hugo award winner (thus my introduction to the series), while Humans was a finalist in 2004. Humans picks up in the office of a psychiatrist (a 'personality sculptor' as they call it), where Ponter is admitting in confidentiality that he has committed a mysterious crime. He proceeds to tell the story to his shrink. It goes something like this: The Neanderthals' governing power decides to re-establish contact with the humans ('gliksins' is their word), and to try to share/trade technological advancements and knowledge with us. They send diplomats across, our worlds interact, and stuff happens. By the end of the narrative, Ponter confesses his crime, and the reader is left to decide for him/herself what to think about it. Despite finding the books very intriguing, I think the author's use of comparing our two cultures as a way to point out our many flaws to be a bit heavy-handed. I appreciate the irony that the Neanderthals are actually the better civilization, more advanced in nearly every way, especially given our common perception of the Neanderthal man as a pretty stupid brute. Unfortunately, I got tired of hearing how bad we've been to our environment, how wasteful, how violent, how paranoid and irrational, weak and greedy we are. That's not to say that I disagree with his assessment. Mankind has quite an ugly history, it's true. The current state of things isn't too great, either. It's just that it comes up so often that I start thinking, "OK, I get it. Yes, the Neanderthal man was appalled by how we ____, terribly sorry." Also, some readers may be offended by the Neanderthals' sexual practices, and others may not like their lack of religion and the way they consider such beliefs highly illogical. Other than that, it was a fine story (as my reviews show, I'm almost always pleased), and I plan to read the third book, Hybrids, sometime soon. I must admit that I'm curious to see whether we annihilate them, or whether we begin to incorporate their superior ideas into making our own reality a better one. Yeah, you'll all be on the edge of your seats for that review, I'm sure.